Targeting South East Asia – a region where the historical growth rate for chocolate sales has far outpaced that of global growth, our Branded Consumer Division manufactures, markets and distributes our own brands of chocolate confectionery products. Driven by a strong management team of talented and seasoned professionals, our strong innovative culture allows us to continually create powerful ‘Winning Ideas’ which in turn gives us a significant competitive edge in building our brands. 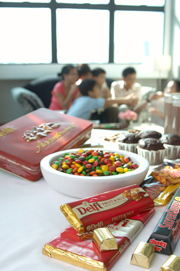 Supported by two chocolate manufacturing facilities in Indonesia and the Philippines, we have a broad brand portfolio that extends across multiple product categories and different price points, appealing to different consumer groups in our key markets of Indonesia, the Philippines, Singapore and Malaysia. Our brands command over 50% market share in Indonesia. From a single marketplace in Indonesia over 50 years ago, we are continually growing our presence and now enjoy superior distribution capabilities across the region. Leveraging our multi-layered distribution network comprising our direct distribution team, a network of third party distributors and sub-distributors, we have the proven ability to build brands, making us the perfect partner for distributing Agency (or 3rd Party) products. We play a key role in promoting and distributing products for 3rd parties in Indonesia, the Philippines, Malaysia and Singapore. Representing a diverse mix of Agency brands, including international food and beverage companies, we distribute products from different product categories in multiple sectors. In all, our distribution expertise extends to nine broad categories extending even beyond the food and beverage category. Please explore this site to find out more about Our Brands of chocolate and sugar confectionaries, our Innovation Capabilities, Distribution Network and Market Presence.